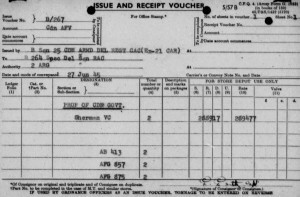 I am very fortunate to know the USA Vehicle Number, the vehicle Serial Number, the details of the convoy it shipped to England on in 1944, the British Army Census number – T-289477, and the vehicle name “Gaucho”… though when the name was applied, is currently unknown. It is rare to find records which relate to a specific vehicle… I had a very lucky break and only because other enthusiasts were kind enough to share their research information (thanks Roddy, Joe and Adrian, greatly appreciated)… without which I would still be very much in the dark. Built under contract S/M 1046 this was the 68th M4A4 off Chrysler’s production line and believed to be the oldest survivor of this type. August 1942 to early 1944. Believed deployed to the US Army Desert Training Centre, where it carried the US Army Number USA-3056683… certainly retained in the USA somewhere for training purposes. Refurbished by Chrysler and received the Applique Armour. Shipped in March as one of 104 M4A4s to England to be converted to the “Firefly” configuration with the 17pdr anti-tank gun at the Royal Ordnance factories in Nottingham under ORD3/LL/04765 on convoy 4-G-5491. History unknown – can you help please? 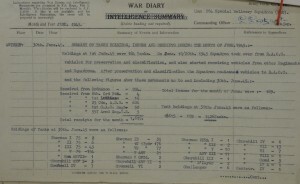 War in Europe is over, vehicles are being recovered, units disbanded, men sent home. 264 Special Delivery Squadron, Royal Armoured Corps, start receiving tanks from RAOC and other squadrons for “Preservation and Classification” (continues until Oct 45). 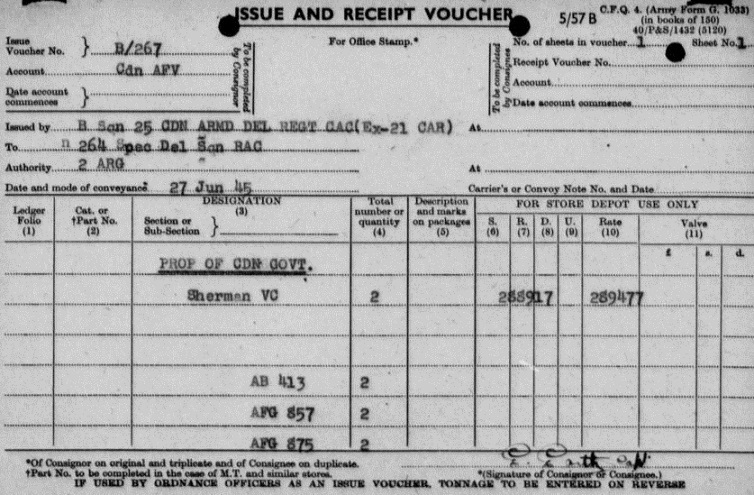 Unfortunately 264 SDS’s War Diaries do not detail the serial numbers received, but from the Canadian archive document evidence, I am confident that one of the 77 x Sherman VC received in June 45 is T-289477. Once Preservation and Classification was complete, vehicles were issued to 167 Vehicle Park RAOC and 256 Army Delivery Squadron… unfortunately the records kept do not determine which units received what Shermans, so T-289477 could have gone to either. I will take a look at 167 Vehicle Park and 256 Army Delivery Squadron’s records in due course to see if they shed any light.